The last couple of days have been fairly lazy: reading, running and shopping. I decided to be a little productive. After painting the master bathroom this fall, there was one part that needed finishing. Above the shower the wallpaper was too moldy and torn to paint, so I ripped it off and installed some pine wainscoat material. Because it always stays damp up there with four showers a day, I stained and varnished the wood so that it can be easily wiped off. 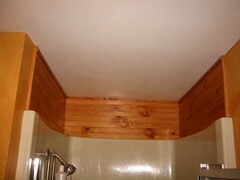 I also repainted the ceiling with a semi-gloss enamel. Hopefully, this will be easier to keep clean of mildew.